As reported in the following Wall Street Journal article, Friday is clearly the best day to list your home for a faster sale which will yield a higher sales price. Read the article below. T.G.I.F. One day of the week can mean an extra $5,000 in a home-seller’s pocket. Last year, homes listed on Fridays sold for 99.1% of the seller’s original asking price, the highest percentage of any day of the week, according to an analysis by real-estate brokerage Redfin. Listing a home on a Friday rather than a Sunday—the worst day to debut—could mean a difference of nearly $5,000 on a $500,000 house, Mr. Kelman adds. Homes listed on Sundays end up selling for 98.4% of their initial asking price. 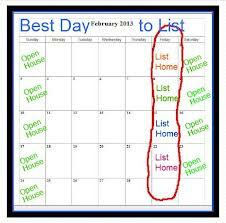 Properties listed on Fridays also sell the fastest—81 days, on average, according to the Redfin analysis. What makes Fridays so special (other than a six-pack and takeout pizza)? Adults who have a Monday-to-Friday workweek tend to be more positive and happier on Fridays, an effect that lasts through the weekend, says Richard Ryan, professor of psychology at the University of Rochester. They also tend to report more vitality and energy on the weekends, which may prompt them to be more proactive in searching for homes, says Prof. Ryan, who has studied how the day of the week affects mood. Conversely, Sunday listings have to sit around for a few days before people start lining up home tours for the following weekend. By that time, newer listings may make Sunday listings seem stale, says Redfin’s Mr. Kelman. One other day seems to dominate the real-estate world: Tuesday. Homes that are listed on a Tuesday garner the most interest for home tours, seeing 2.41 home-tour requests, on average, the Redfin numbers show. Tuesdays are big planning days for many people, says Francesca Gino, associate professor of business administration at Harvard Business School. Productivity peaks at the beginning and end of the workweek, and so some may use Tuesday to nail down weekend plans for home viewings. Of course, not all real-estate agents focus on Fridays and Tuesdays. Takk Yamaguchi, an agent at Town Residential in New York, lists about 70% of properties on Wednesdays or Thursdays. “That’s the sweet spot,” he says. He finds that many buyers seem to book their weekend home tours by Thursday afternoon. In the end, Mr. Yamaguchi won’t hang on to a listing waiting for a specific day. Listing later in the week helps, he says, “but it’s not necessarily going to be a game-changer.